The Leverton family has been arranging funerals for people in this part of London since 1789. Yes, they’re now into their eighth generation; they’re steeped in heritage, drenched in history. This makes them an attractive-seeming proposition. After all, a good old family business is exactly what most of us hope to find when we’re looking for a proper funeral director. What you don’t want, though, is a barnacled, backwards-looking business existing in a dusty Dickensian time warp, the sort of place where everything is done as it always was. Heritage is good, obsolescence is bad. Leverton’s, we are delighted to tell you, is not a firm that sits complacently on its laurels. It is not only progressive and dynamic, it is also, as you will see, excitingly innovative. Leverton’s may look back with satisfaction and pride on a distinguished past, but it looks to the future with purpose and energy. This is an intelligent, modern business. It needs to be. Demographics in London alter very quickly and an undertaker needs to be able to respond to and meet the diverse, ever-changing needs of all the different communities in their area. Just in case you’ve picked up on the fact that Leverton’s has been chosen to do some extremely prestigious funerals (it has), do not, please, suppose that it is extremely expensive, that it’s the undertaker of choice for ‘them’ not ‘us’. Nothing could be further from the truth. Leverton’s looks after all the people in this part of London, whoever they are, whatever their needs. What’s more, they treat everyone exactly the same. So if you’re on a budget, you won’t find them expensive. If you want to arrange a very simple funeral, or a direct cremation, they’re there for you. They are very open. They are one of far too few undertakers who post their prices on their website. There are six branches. Headquarters is at Camden Town in a fine building in Eversholt Street. It’s a homely, friendly old place where you feel agreeably removed from the bustle of everyday life. You will meet your funeral director and make your arrangements in one of the rooms downstairs. You won’t go upstairs — but we did, because we insist on going everywhere and seeing everything. This is where all the funeral directors work amid historic portraits of Levertons. And it’s where Allan, the logistics maestro, organises the people and the cars, etc, for upcoming funerals. 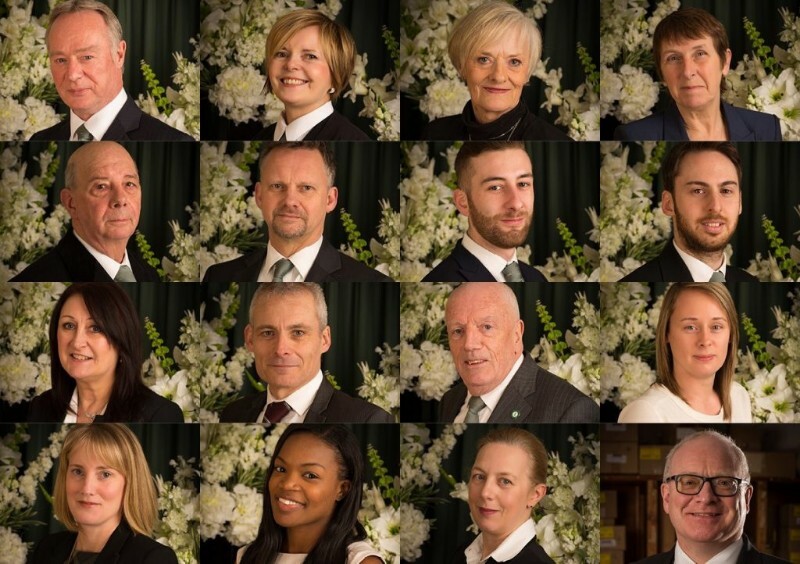 The branches — at Muswell Hill, Gospel Oak, Hampstead, Golders Green and Kentish Town — are smaller and looked after by just one person with whom you’ll arrange the funeral, and who will most probably conduct it on the day. Levertons do everything they can to ensure that one funeral director looks after you all the way from making the arrangement to being there on the day of the funeral — a big, big plus point. Someone who has died is driven to the mortuary at Chalk Farm. There, they are looked after by Peter, Tony and their team, and made ready for their funeral. If you want to visit the person who has died, they will be driven from there to your branch. If you want to play your part in washing and dressing them, you can, by arrangement, go down to Chalk Farm and they will either help you or leave you to it — whatever you want. They’ll be delighted to see you and support in you in any way they can. And they make an excellent cup of tea. The mortuary, for us, is the most important part of any funeral firm. It is the heart of the business, the place which embodies its values and ethos. We were very impressed by what we saw. It is bright, spotless, professionally equipped and staffed by the right sort of people. The only thing we didn’t much like was the rather old floor. They don’t, either, and they’re about to replace it. We spent time talking to people who work here, especially Peter and Tony. You’ll probably never meet them, but what they do is incredibly important. And don’t they know it. Both of them are people of great heart who take their work extremely seriously. Standards of care are very high. They live round here, and every once in a while someone they know comes in to be looked after. Everyone is treated with kindness and respect — everybody is ‘one of us’. Peter and Tony are both rounded characters whose strong seriousness is harnessed to an excellent sense of humour. They are precisely the sort of people you would want them to be. We visited all the branches and met all the managers. We liked them all very much and satisfied ourselves that they will give you all the time you need. Leverton’s is a good firm to work for, so they attract the best people. If it’s a traditional funeral you want, they’ll do it very well and very smartly in the classic Victorian style. Though prestigious, Leverton’s are not as showy and flamboyant as some London funeral directors. If you would like something less formal they will willingly adjust to what you want. Leverton’s is keen to tread lightly on the earth, and as testament to this commitment it is the owner of the country’s very first electric hearse. Clive Leverton invested a huge amount of time and money to work with Brahms Electric Vehicles designing and developing the Eco-Hearse, and many of Leverton’s families choose to use it and it’s accompanying passenger eco-car rather than have a traditional gas guzzling cortege. Leverton’s is forward-looking in all sorts of other interesting ways, too. For example, it is the only funeral director’s offering highly specialised makeup for people who have died — only if you want it, of course. A former director of the company, Richard Putt, is a trustee of the Natural Death Centre, which campaigns for greener funerals, and he has left his imprint on Leverton’s approach to funerals in general. Leverton’s is not innovative for the sake of it. They want to offer the widest range of choice they can allied to the highest-quality personal service. You are in charge: they’ll do what you ask, and they’ll do it to the best of their ability. Everyone here is down-to-earth — nice, normal, broadminded. Funeral directors can tend to be somewhat, well, pompous, but not here. There is a very agreeable modesty about all of them — it’s something of a hallmark — and this, of course, makes things so much easier for you. • Your first call will be answered during office hours, by a funeral director or an experienced member of staff – never a call centre.• Home Visits – They will happily come and see you at home to make arrangements if you would like that.• Embalming – They will discuss this with you. Embalming can make people who have died look more themselves, but if you don’t want it, just say so. They won’t pressure you.• Continuity of Care – It is almost certain that the person with whom you arrange the funeral, bar sickness or holiday, will lead the cortege on the day – there will be no stranger who’s taken over. If it can’t for some reason be that person, the funeral director who will be in charge on the day will introduce him/herself well in advance. If, when you call, the manager of the branch is away (possibly conducting a funeral), the person who is covering will make arrangements with you and either conduct the funeral or introduce you to the funeral director who will. The important point is that someone you know will be there for you on the day. • Family Participation – If you want to carry the coffin, they’ll show you how. This is something they encourage. If you’d like to come in and wash and dress the person who has died, they’ll be there for you. If you’d just like to come in do their hair and nails, that’s absolutely no problem. They believe in empowering you to do what you want and they’ll help you in any way they can. • Ethnic Specialism – They are highly experienced in all funeral customs. • Home arranged funerals – Will gladly work with you in any way you want if you wish to care for the person who has died at home: see the Do It All Yourself section of the Good Funeral Guide website. • Website – Comprehensive information well set out. All prices shown here. An unusually well-written website which reflects humanity and lack of pretension. • Client Support – They have an online book of remembrance which gives you the opportunity of collecting money for a chosen charity. If you want to be put in touch with a bereavement support group they will make that happen for you. After the funeral, call in anytime for a cuppa – they’ll always be pleased to see you. • Money matters – Competitively priced. If money is any sort of a problem, be completely upfront about it and they’ll be able to give you all the help they can. Flowers – They can recommend good florists. Masonry – They can recommend stonemasons who will make you a headstone. Getting there – Hampstead: Tube: Belsize Park, premises right opposite. Buses: 168 46 C11. On-street parkingall round – meters. Muswell Hill: Tube: East Finchley, buses and minicabs outside or 10-min walk. Some free onstreet parking close to premises. Golders Green: Tube: Golders Green, premises 150 meters away. Some on-street parking or use Sainsbury’s round the back, free for 1 hour. Lots of buses stop just outside. Kentish Town: Tube: Kentish Town + 10 mins walk (max). Limited pay-and-display parking. Good buses: C2 214 134.Gospel Oak: Best reached by bus or car. Onstreet parking (meters). Tube: nearest are Kentish Town and Chalk Farm – Belsize Park at a stretch. Down-to-earth, very decent people who will, with kindness, care and invisible expertise, help you create exactly the funeral you want. There aren’t many funeral directors who give their clients as much time as the Leverton’s team. Very nice people. Levertons have just handled the arrangements for our relative, and we can’t recommend them highly enough. Every one of the Levertons team treated us with genuine kindness, helping us work through the arrangements without fuss, so that we reached decisions which were fitting, and which were our own. They were easy to deal with and straight forward. Our funeral director, Carmel, guided us gently through the process and smoothed the path so that a daunting task became much simpler. Levertons charges were also extremely reasonable. We will definitely use Levertons again.